Seeking Health Optimal Prenatal is an advanced formula designed especially for pregnant and pregnancy-planning women, recommended to use also in the period of breastfeeding. The supplement provides the organism with a complex of vitamins, minerals and nutrients, which promote proper course of pregnancy and support the development of a child from the moment of conception. Additionally, the preparation is rich in easily assimilable vegetable protein, which is an important source of amino acids. Innovative formula of the preparation ensures maximal comfort of supplementation. On the basis of the powder, it is easy to prepare a delicious, nutritious, chocolate shake. It is real facilitation for pregnant women, who deal with morning sickness and have problems swallowing pills. In the supplement all key vitamins were contained: A, C, D3, E, K2 as well as B-group vitamin complex (including folic acid). They will allow to maintain homeostasis and health of the organism. Complementing potential deficiencies should be a priority for potential mums, as deficiencies of some vitamins may deepen the problems with getting pregnant and maintaining pregnancy. It is worth remembering that the need for vitamins during pregnancy increases. They have large influence not only on the organism of a mother-to-be, but also the developing fetus. They support nesting of a fertilized egg cell in the uterus, stimulate the development of certain systems and organs in the developing fetus, decrease the risk of malformations. A large part of vitamins contained in this supplement appears in a double form, which improves their bioavailability. Moreover, thanks to this, the supplement may be also taken by women, who have problems with conversion of vitamins to their biologically active forms. The supplement provides a wide range of minerals important for the functioning of the organism. This group encompasses both popular elements (calcium, magnesium, zinc, selenium, potassium) as well as more rarely met in supplements, such as iodine, manganese, chromium or molybdenum. Next to vitamins, they are the main compounds which influence the work of the organism. They condition its development and growth, enable proper course of many important enzymatic processes, allow to maintain proper water-electrolyte balance. They also play structural functions, i.e. they build tooth, bones, skin, hair and soft tissues. It is worth mentioning that the preparation is free from synthetic iron. It contains only a small amount of this element, naturally occurring in the mix of vegetable proteins. Specialists highlight that supplementation with iron during pregnancy should be medically justified and is not recommended to each woman. The majority of minerals present in the supplement is in the form of patented chelates (Albion® and TRAACS®). This formula is characterized by very high assimilability and at the same time it reduces the risk of toxicity resulting from overdosing. Plant extracts ensure the organism the access to biologically active, unique compounds, which may improve the state of health. The representatives of this category are: milk thistle extract, standardized for the content of silymarin, which supports liver functions; ginger root extract which improves digestion, has antiemetic activity and effectively alleviates morning sickness that bothers pregnant women; red raspberry leaves, which support the functions of the female reproductive system and promote lactation. The supplement was complemented by other compounds, which support the work of particular organs and systems in the body and are rarely the components of vitamin-mineral formulas. In this way, the preparation comprehensively influences the organism. In the composition of this group there is choline, which helps to shape the brain and the nervous system of the fetus and additionally, it demonstrates epigenetic potential; coenzyme Q10, which strengthens antioxidant barrier and is conducive to proper cell integrity; betaine anhydrous, which supports the process of methylation and helps to decrease the concentration of homocysteine; lutein and zeaxanthin, important for eyesight and promoting proper vision; carnosine, which demonstrates strong antioxidant effect and is able to eliminate heavy metals from the organism; inositol, supporting fertility; taurine, important for maintaining proper functions of the reproductive system (its deficiency in the organism of a mother may impair the absorption of vitamins in breastfed newborns) and Acetyl-L-carnitine, which stimulates the development of placenta and improves intrauterine nourishment of the fetus, which is reflected in higher mass of a newborn baby. In the composition of the preparation a large content of full vegetable protein deserves special attention. Proteins are a key macroelement in a diet of pregnant women - they build organs and tissues of the developing fetus and moreover, they provide valuable amino acids, which condition proper growth and ensure essential life energy. The preparation combines pea and rice protein concentrate. It is characterized by perfect amino acid profile, contains little fat and is easily digestible. It does not increase the risk of food allergies, is free from problematic casein and allergizing lactose. 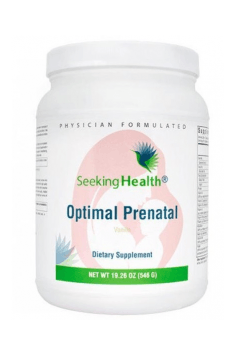 To sum up, Seeking Health Optimal Prenatal is an ultramodern supplement for pregnant and pregnancy-planning mothers. In comparison to other preparations, it is distinguished by rare, wide composition and ensures comfort of supplementation thanks to its form. The preparation resembles traditional protein supplements. It contains a lot of proteins from vegetable sources. Alternatively, it may be used by women, who are not pregnant, but are physically active, due to which they demonstrate increased needs for nutrients and protein. The supplement contains properly balanced doses of vitamins, minerals and nutrients, therefore the daily recommended dose should not be exceeded. The preparation contains all the most necessary compounds for pregnant women (i.a. folic acid in biologically active form), therefore it should not be combined with other preparations containing folic acid. The powder may constitute a perfect base for a shake. For diversifying, it may be mixed with milk, juice or water and served with other ingredients, such as fruits, chia seeds, nuts etc. Pea protein concentrate, cocoa powder, evaporated cane juice, natural flavors, glycine, sunflower oil, taurine, medium-chain triglycerides oil, cellulose gum, xanthan gum, rice protein concentrate, stevia leaf extract, and L-glutamine. Ingredients - general definition says that these are the components and raw materials, forming a formula of specific products. Ingredients can be single elements, as well as the compounds and complexes of all processed and unprocessed their sources. It the following division of components is used: food, nutrients and minerals. A legal obligation is to place all the ingredients present in the preparation (or drug), in descending order, i.e., starting from component of which the content is the highest in the formulation.